Build On What you Have Build your platform with what you already have before you start spending time and money creating new stuff. Effective, long-term results can be free (or inexpensive) It’s no longer the 1950s. You don’t have to spend big bucks to put an ad out in a big newspaper like The Washington Post to make your book known. In fact, there are so many more effective ways to market your book for free, and you most likely have all the tools right in front of you. Yes, talk show appearances or a book review in a prominent newspaper will certainly boost sales and generate buzz. But that can last only a few days before people move onto another story. If you want to keep that buzz going, just log onto your Facebook or Twitter and start some conversation. Or better yet, post a blog or fun video to connect to your readers. Numerous bestsellers began as blogs, and if you formulate a smart social media strategy, you can grow your social network by more than 400 percent in as little time as six months – we’ve seen it happen. Apart from your online network, look at your personal and professional relationships. Who has a big following that would be willing to share your book with their contacts? What organization or company do you have a connection to that could benefit from having you speak or sell books at an event? Reach out to these people. It doesn’t have to be tacky or commercial if they already know and care about your work. 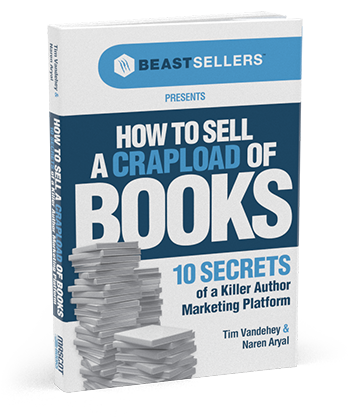 To read more about Build On What You Have or to read all 10 marketing secrets now, send an email to marketing@mascotbooks.com and we will send you a free copy of How to Sell a Crapload of Books: 10 Secrets of a Killer Author Marketing Platform by Naren Aryal and Tim Vandehey. Stay tuned for Secret #5!